Voyager was bought by us principally for his superb bloodlines being by Threapwood Venture. He has produced some lovely foals for us and we retain two daughters here in the stud, Brockville Merry Margo & Brockville Merry Mischief both out of the chestnut mare Weewaif Merry Melody. Another daughter, Brockville Valetta out of Sapphire Virtue is with Mrs Rae's Samber Stud in Devon. Due to our decision to stop breeding for the next few years, Voyager has gone to join a stud in Cornwall and is settling in well in his new home. Oliver was the first Shetland pony we bought and he proved to be a very good purchase. Two of his sons, Brockville Venture & Brockville Vintage both out of Hose Virtue are licensed stallions. Another full brother to these two, the bay Brockville Vermont was born in 2010 and we think he is possibly the best colt we have ever bred. If other commitments allow, we aim to show Vermont in 2012. All of Oliver's offspring have been much bigger than him with plenty of bone and all have had lovely heads. 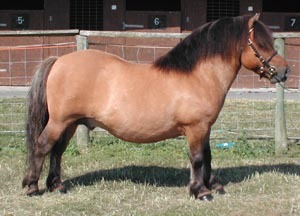 Flash was used by us for a number of years producing mainly duns of varying colours to different coloured mares. His daughter Brockville Ella out of Hose Emmaline was a big winner in the show ring as a youngster winning many classes in top company. Another daughter Brockville Verona out of Hose Virtue has been retained by us. Flash has now been sold and we wish his new owners the very best of luck with him for the future. Venture needs no introduction being very well known in the show ring throughout the country. 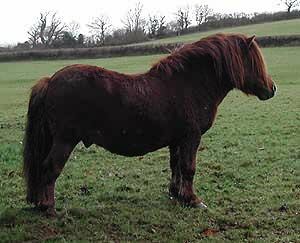 He is by our chestnut stallion Weewaif Bath Oliver and out of Hose Virtue. He oozes quality, has so much presence he doesn't know what to do with it and has sired some top quality foals including a superb bay colt in 2010 out of Hose Emmaline called Brockville Enterprise. 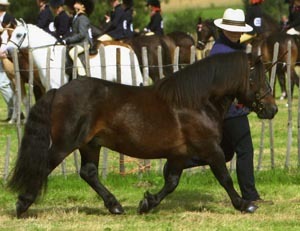 He has been shown extensively winning many Championships and Supreme's including Supreme Championship at the SW Shetland Pony Group Show, Reserve Supreme M & M Champion at Honiton, Champion at the Wessex Group Show, Reserve Coloured Champion at the Society Breed Show in & Champion at Devon County Show. Shown only twice since our move to Scotland he was Reserve Champion at the Black Isle Show and Champion at Banchory. We look forward to showing him again in 2012 alongside his full brother, Brockville Vermont. Slow to mature as all this line are, he was first used in 2007 at Mrs Rae's Samber Stud. Amongst the foals he produced was a stunning dun colt, Samber Scholar out of Ladbury Vanessa. This colt has been shown extensively winning many Championships and has now been licensed with his first foals due in 2012. In 2008 Fetlar headed back to Shetland on loan to his breeder where he has sired more good foals. 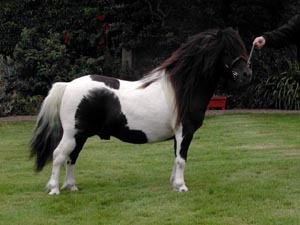 In August 2008 Fetlar attended the Shetland Stallion Evaluation Scheme where he was awarded a coveted gold medal achieving one of the highest percentage scores to date. The photograph above was taken on that day by Miss June Brown. Vintage is a full brother to Venture and for this reason has not been used in our stud. He has however been leased to Mr James Swan at the Stow Stud and produced several good foals for them including a filly Stow Velda out of Stow Velveteen who has had much success in the show ring. Due to our decision to significantly reduce the size of the stud, Vintage is the last of our stallions to be offered for sale. Full detail of him can be seen on the For Sale page. Copyright © 2003. 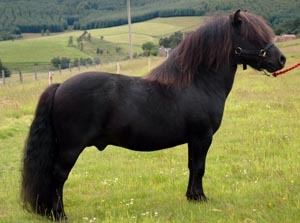 Brockville Shetland Pony Stud. All rights reserved.